Also refer to the Live Demo along with this documentation. · Navigation Mode: Hover or Click. On click navigation mode, tick the box to stop auto slideshow when a button is clicked. 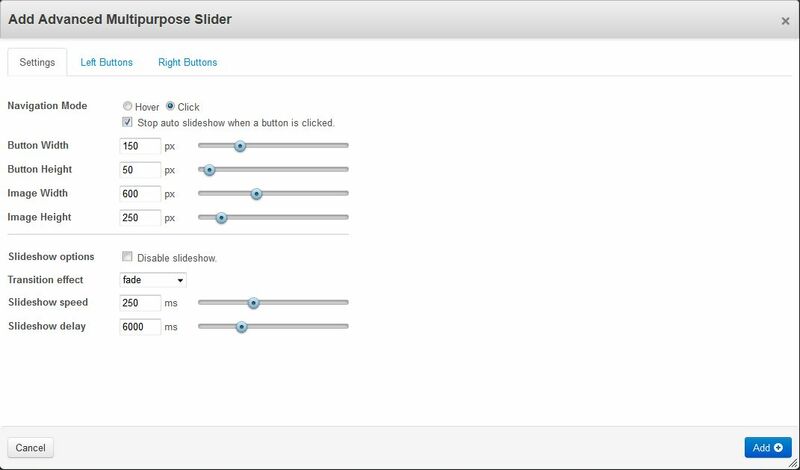 · Button width/height: Set the width and height of buttons. · Image width/height: Set the width and height of the slide area that contains images or content. · Disable slideshow: Tick the box to disable auto slideshow. · Transition effects: Choose from 25+ transition effects for the slideshow. Almost all of them work for images. Some of them may not work smoothly on text-based content. Just experiment and choose the right one for you. · Slideshow speed and delay values. You can easily add a new button or delete one of the existing buttons. Drag the icon on the right to sort the buttons. Button Text: This is the label of the button. 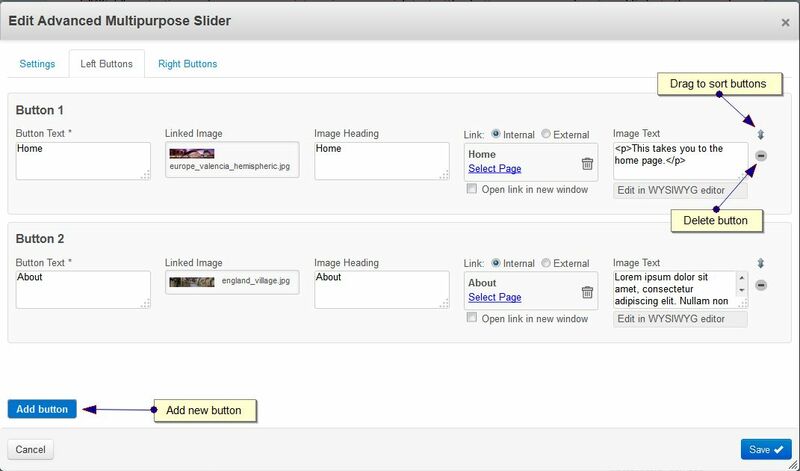 Linked Image: When Button Text is hovered or clicked, Linked Image is displayed on the slide. Image Heading: When Linked Image is selected, Image Heading appears as the image caption. Link: Internal or External. Also provides an option to open link in a new window. Link is applied to Image Heading if present. If Image Heading is empty, the link is directly applied to Button Text. Image Text: When Linked Image is selected, Image Text appears as a image description. Buttons and links. How to create Standalone buttons? You can choose different ways to have the button function. An example below demonstrates one of the options where a button has a link applied to it as well as an image and a text associated with it. In this example, with the Click navigation mode, when you click the Button Text, it takes you directly to the link. Clicking the area outside the text however updates the slide in the middle content area. How to use text instead of a button? 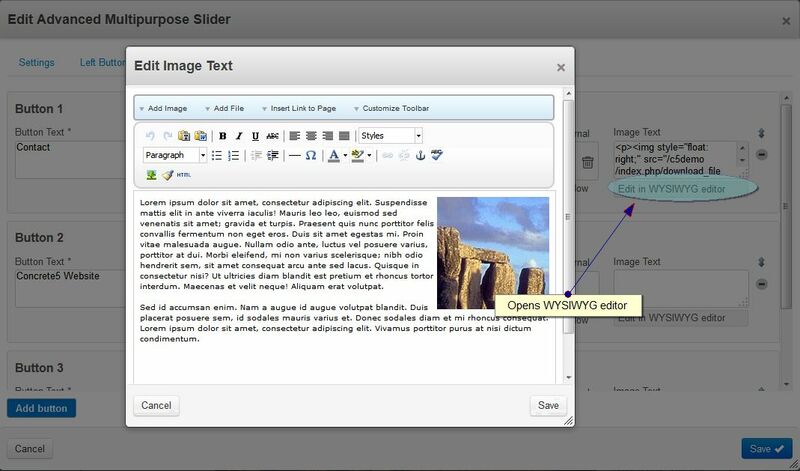 Image Text can be added/edited using WYSIWYG editor for creating rich content.